Twenty-one years ago today, April 11, 1988, I was eleven years old and stayed home from school even though I don’t think I was actually sick. My Mom called the school and told them I was sick & couldn’t go. In my memory, this was the first time I didn’t go to school, even though I probably could have. I don’t know if there were some cosmic forces or supernatural energies moving through and around my body that day, telling me it would be different. I remember sitting in my living room, wearing pajama pants and a t-shirt, watching daytime television. My mom was probably scolding me for not wearing socks, even though my feet weren’t cold. It’s easy for me to remember what it was like, staying home from school when it’s not a holiday or weekend. Television is so different! Kid friendly shows that aired from 6 to 8 or 9am stopped airing. This was before Nickelodeon, Noggin, and all that… at least in my household, and I remember the rare treat it was to be up early enough to see “The Muppet Show” at 6 or 7am. During the day, we had the Window to the World, public access channel 11, with “Sesame Street” and “Mr. Roger’s Neighborhood”. However, as an 11 year old, I was starting to outgrow that and had to wait until around 2 or 3pm for shows like “G.I. Joe”, “Transformers”, and of course afternoon Cubs’ games with Harry Caray, Steve Stone, and Dewayne Staats. Back to the action, so I’m sitting on the floor using the coffee table to have some French toast and orange juice. The juice would be really good. My mom would use about 28 oranges to be able to fill about 80% of a small glass, but it always tasted great. Still, I had a horrible feeling in the pit of my stomach. Was it guilt from sort of faking an illness? Or, was I actually feeling something more intense? My life changed that day. So, I’m sitting there, watching a stupid game show like “Family Feud”, “Press Your Luck”, or “The Price is Right” when my mom lets my dad into the house. They had divorced about 2 or 3 years before this time, and I thought my dad had come over to check up on me, as a doctor. He and my mother were quiet, too quite. I eavesdropped, and when I heard my dad say that we lost my grandfather, my whole world shattered. I had been privileged enough to live the first eleven years of my life without feeling any real sense of eternal loss. This hit me hard, and I can still see the images and feel the emotions of that day. 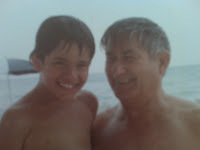 My grandfather was the most inspirational, compassionate, and fun-loving individual I’ve known. A day doesn’t go by without his memory. My grandfather was from Cuba, so he had a lot of knowledge about the game of baseball. As is also popular on the island, he was a big fan of the sweet science. I spent a few months at a time with my grandparents, summers while I was 8, 9 years old, etc. He and I would watch Tuesday Night Fights (or was it Sunday?) on USA Network. He loved boxing and I started getting into it. I remember rooting for Boom Boom Mancini and his bloody face. I remember being inspired enough to shadow box in the shower. 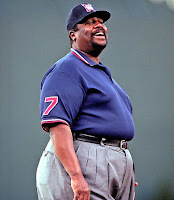 Still, I loved baseball more. The game always made sense to me, and I couldn’t get enough. My grandparents lived in Miami at the time, and I remember their cable got Cubs, Braves, and Mets games through WGN, TBS, and the Mets’ channels. Perhaps the best game I’ve ever seen was July 22, 1986. The starting pitchers were Bob Ojeda, for NY, and Scott Terry for the Reds. Both starters went five innings in what seemed to be a forgettable game that was 3-1 Reds after the fifth and the same score after eight innings. In the 9th, Howard Johnson pinch hit for light-hitting shortstop Rafael Santana. He struck out, but reached 1st base on a passed ball. Mookie Wilson promptly grounded into a double play before Lenny Dykstra walked, Tim Teufel doubled to center, and Keith Hernandez knocked them both in while reaching base when Dave Parker dropped a routine fly ball. This was so long ago that John Franco was summoned by the Reds to pitch against Hernandez. That was a nice little comeback, that probably shouldn’t have occurred, but the 10th inning is where the real memories begin. First, Davey Johnson realized his bench was shrinking rapidly, so with one out he used starting pitcher, Rick Aguilera (no relation, but pictured on left), as a pinch hitter – who drew a base on balls! Ray Knight singled, and after a wild pitch, Aguilera and Knight are on 2nd and 3rd, with one out. Needing only a hit or deep fly ball to take the lead, HoJo struck out, Mookie was walked intentionally, and Dykstra struck out. Inning over. In the Reds’ half of the 10th, all heck breaks loose. First, we see Jesse Orosco come in to pitch for the Mets, and player/manager Pete Rose sends himself up to bat for John Franco. He singles and inserts Eric Davis to pinch run for him. (How are guys like HoJo and Davis on the bench?) Davis proceeds to steal 2nd base. Then, he steals 3rd base, slides hard into Knight, and promptly gets slugged by a Ray Knight right cross to the jaw. My 9-year-old eyes bugged out of my head and jaw hit the floor. I had never seen anything like that. All in all, Knight, Davis, Kevin Mitchell, and Mario Soto (who wasn’t even in the game) were ejected for brawling. After the dust settled, we were left with a much depleted Mets’ bench. Gary Carter went to 3rd base, Jesse Orosco moved to Right Field as Roger McDowell came in to pitch. In the 11th inning, Davey Johnson switched Orosco and McDowell, bringing Orosco back to the mound, and effectively turning this into a little league game. The final memory that sticks with me is how upset Pete Rose was with these moves by the Mets. I can’t remember exactly, but either McDowell or Orosco went into the dugout to switch fielding gloves during one of the moves from mound to Right Field. Pete tried to argue that once a pitcher leaves the field of play, he’s out of the game for good. He argued and argued, to no avail, but what I will always remember is that he was sitting in the dugout until the game ended with his nose buried in a rule book, as he tried to find the rule to support his cause. I don’t remember much more except this game became such a spectacle that in the Top of the 12th, the Mets sent up the lineup of Jesse Orosco, Roger McDowell, and Howard Johnson. If that’s not ridiculous enough, Orosco batted again in the 14th, drew a walk (! ), and scored on Howard Johnson’s dramatic homerun. The Mets wound up winning 6 to 3, while Pete Rose flipped page after page of the rule book. Hall of Famer Tony Perez played in this game; I didn’t remember being old enough to see him play. Larger than life Eric Gregg was the umpire at 3rd base that night. Mario Soto had a 12 year career – all with the Reds – and he never appeared in more than 54 games. Eric Davis hit 27 HR’s and stole 80 bases that season, yet he wasn’t starting this game.